OK, let’s start here. I have quite a few vintage-to-antique cookbooks dating as far back as the late 19th Century. I have cooked from them for years, so I’m used to the sometimes more casual approach to measurements that some of them have. 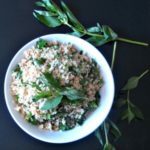 (I also, for fun, work with recipes dating back to the 13th century, which have even more casual measurements – if any – and everything in between. 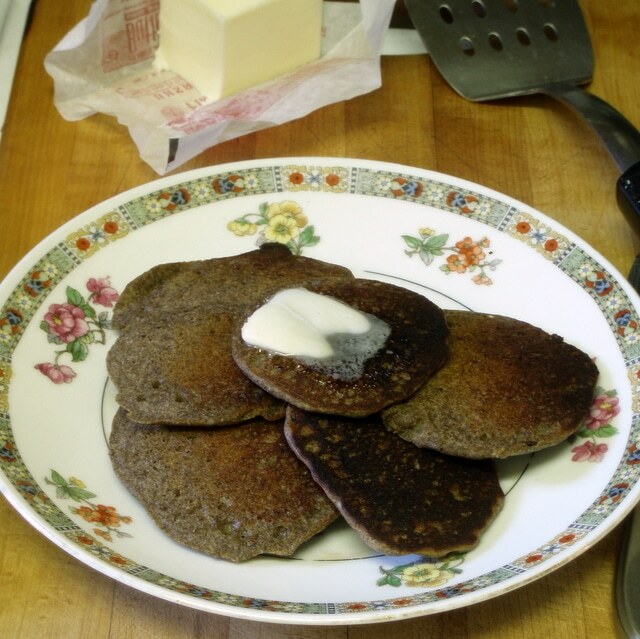 And some of my friends, who have done that with me, are laughing as they read this…) When I was writing about buckwheat, I went back to the old books, and found a really interesting recipe for buckwheat pancakes. Into the buttermilk stir enough flour to make a soft batter;add the yeast cake dissolved in a little warm water and the salt and beat thoroughly. Let rise over night and in the morning stir in the molasses and baking soda. 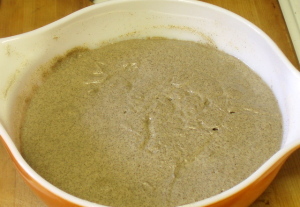 Save a cup of the batter to be used instead of yeast for the next baking. 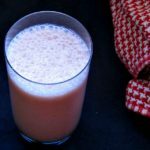 Note – Buttermilk is thicker and less… liquidy… than the milk my other recipes called for. 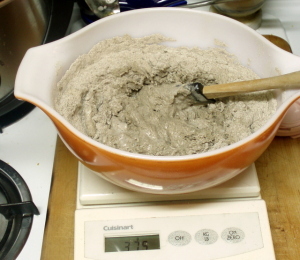 Note – Buckwheat flour weighs 4½ oz per cup (according to King Arthur Flour, who should know.) So, while I did see one source calling for equal weights, the fact that most called for equal numbers of measuring cups should have had me aiming at 250 grams or so to begin. Note – My scale may be wonky… Well, unlike the others, that doesn’t count as something I should have known, I didn’t realize it until a day later, when it wouldn’t hold a tare weight. So I don’t know if that factored into this at all. Probably not, but… as I worked it did keep shutting down. So… I dumped in some flour, stirred a little, added some, stirred a little, added more…. oops… 325 g was suddenly much too much. This was no soft batter – it had the texture of clay. OK, so now I tossed out the inept non-scientific sciency stuff, and worked on rescuing the batter. First, I poured in, a little at a time, all the rest of the buttermilk I had… which was probably about a cup. (I bought a quart, I’d used a glass in something else.) 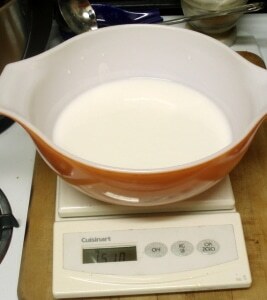 Then I added a little more plain milk… not at all sure, now, how much. 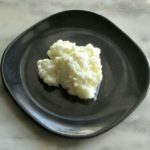 I decided that, well, yeast grows anyhow… and I was making this in the afternoon, not evening, so it would be sitting about 16 hours, rather than the 10 or so I think of for “Mix this after dinner, use it at breakfast.” So – a cake of moist yeast is the equivalent of a packet of dried yeast, which in turn is 2½ teaspoons. So I softened a rounded half teaspoon (I was past worrying about precise measurements…) in a spoonful of water, and stirred it in, with the salt. Then I set it aside to work overnight. Note – The original recipe has you add the molasses later – it is flavoring, not something added to feed the yeast. Yeast does perfectly well with just the flour. 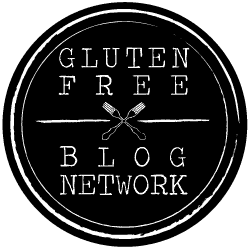 I make yeast bread without added sugar all the time. Anyhow – in the morning I found this. I stirred it down, added the baking soda, skipped the molasses because I don’t use added sugar and it is just flavoring and sweetening here (and that tiny amount won’t alter things drastically) and proceeded with pancakes. Well, first I did, in fact, put aside a cup of batter, to play with later. Because I’m crazy that way. For this, I pulled out the cast iron pan that belonged to the same grandmother who owned the book, heated it and buttered it lightly. 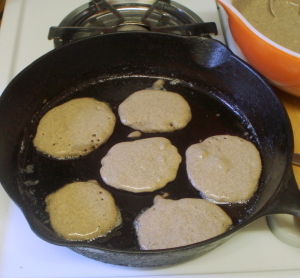 I tend to make smaller pancakes, traditionally called Silver Dollar Pancakes, because I can fit several in a pan, they cook more quickly than larger ones, and they’re easier to turn over. So I poured in my dollops of batter, and waited for the bubbles all over the surface that tell me a pancake is cooked enough to turn. OK, so…. I don’t know if this has something to do with this being, in fact, a gluten free pancake so it behaves differently, or if it is a sign that the yeast wasn’t working, or that I should have increased the baking soda more (though honestly I have no idea why it even calls for baking soda, when it’s really not enough to do much in that much batter, and the yeast should provide enough leavening) but anyhow – no bubbles. But the top was getting the dry look I recognize in other bready foods, so I turned the cakes, and they certainly were cooked enough. Then I just browned the other side, gave them to Rich, made a second batch for myself, and ate them with a little butter. I don’t think they need syrup, but if you do (Rich did) please do use real maple syrup – the flavor of these deserves the flavor of the real stuff, not just sweetness. Or some of that molasses. Or… I’ll be making applesauce and apple butter, soon – these will be wonderful with apple butter. Really, though, that’s gilding the lily – the butter was enough. After breakfast, I went ahead and made up the rest of the batch, so I can now also tell you they microwave nicely, so you can make a batch and use them for several meals. I’ve been eating them with eggs on the side. 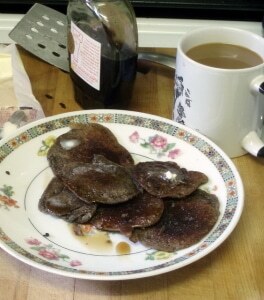 I did try them once with the beans I eat, but, while that was OK, the beans masked the taste of the pancakes – no point in that. These deserve to stand on their own – with sausage and eggs, the next day. And now I’m going to go play with the reserved batter. 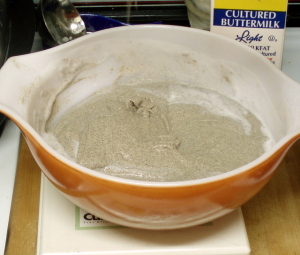 I’m thinking this is something I can just keep in a covered bowl, and mix up the batter at night, and use half in the morning, and… keep going…. I’ll let you know. But sometimes – you can still have good pancakes. Thanks! 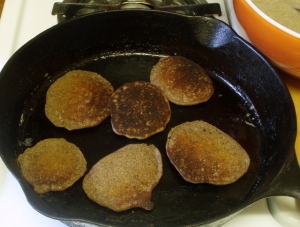 Right now, I'm playing with keeping starter overnight - sourdough buckwheat pancakes, oh, my! I'll be writing up both the original and that option - the first batch was milder than the one made from starter, and I can see people liking both options. And I will give real measurements! We used to have these quite often, when I was a child. They were always served with Butter and Molasses. It seemed like an old family thing. 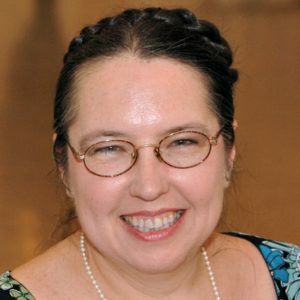 My Family is Northern European. I know they're not English. But, I am curious, could the recipe with Molasses be Swedish, which I think it is, or Lithuanian or even Russian. I'm just curious where it comes from. Oh, wonderful! And thanks for reminding me of this - I really need to write up this recipe properly... I have no idea where it came from, originally. 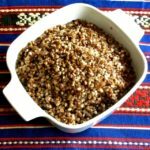 I've only seen it in this form in vintage American cookbooks - buckwheat was much more common here a century and more ago than it is now. 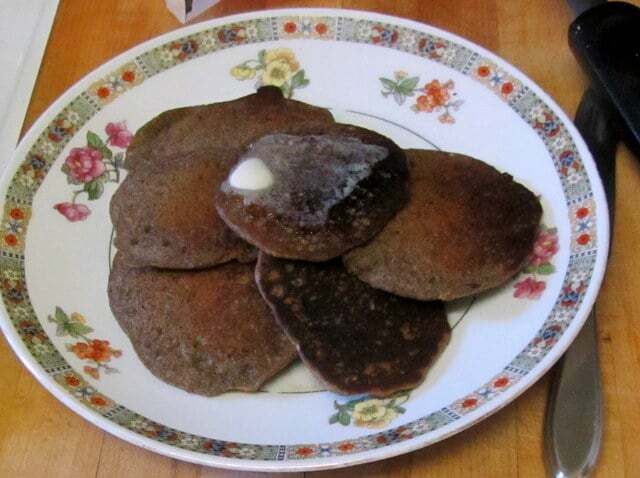 (Somewhat more common than now into the fifties/sixties...) Russians use buckwheat for blini, which are little pancakes but without the molasses. In fact, I don't really remember seeing molasses in traditional Northern European cooking at all - though I'm no expert. (Of the cultures you mention, I know nothing about Lithuanian cooking - a little more about Russian, and a fair bit about Scandinavian in general.) Molasses is much more commonly used in America, where it is a byproduct of the sugar industry. 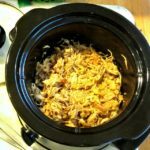 Many cultures in the US adapted old country recipes to more readily available ingredients - could that have happened? 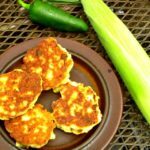 Anne, my boyfriend is thrilled I was able to find this recipe for him - fond childhood memories of his grandparents serving these frequently, without the sweetener. 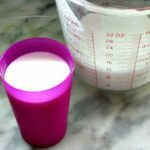 Question please: after you hold aside one cup for the future, do you repeat the recipe above - add buttermilk, buckwheat flour, salt, and yeast or just buttermilk and flour? Thank you! I'm so delighted! I love moments like this... Mix in flour, buttermilk and salt. The yeast is still in the reserved batter, and will grow more when you let the next batch rise... It's essentially like a sourdough starter, if you've ever used that. And of course, you can just start fresh each time, if you want - I found it got more tangy over time, so you can see if you like that or not. And thank you for reminding me of this recipe! I really do need to come back to it... And I hope he enjoys it!